Left to Right: Dan Grimm, Kevin Govero, Robert Harris, Tim Gramling and Dan Muser – Tree Advisory Board Members planting a Red Sunset Maple in Kiwanis Park. 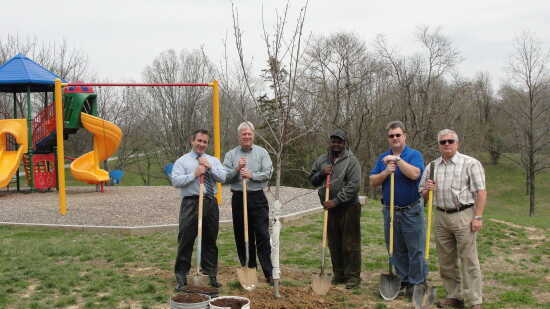 The Cape Girardeau Tree Board planted a Red Sunset Maple Tree at Kiwanis Park last week. The tree was planted as part of the State of Missouri's Observance of Arbor Day Friday, April 2. The observance of Arbor Day by the City of Cape Girardeau is one of the criteria for recognition as a Tree City USA. Cape Girardeau has been named a Tree City USA by the National Arbor Day Foundation to honor its commitment to its community forest. It is the tenth year Cape Girardeau has received this national recognition. Cape Girardeau has met the four standards to become a Tree City USA: a tree board or department, a tree care ordinance, a comprehensive community forestry program and an Arbor Day observance. "This year's record number of Tree City USA communities shows a growing level of dedication and care for our urban forests," said John Rosenow, president of The National Arbor Day Foundation. "It shows the people of Cape Girardeau value trees for the beauty, grace, comfort, and practical blessings they bring." "The trees in Cape Girardeau help clean the air, conserve soil and water, and reduce heating and cooling costs by moderating temperatures," he added. "Tree City USA honors the countless men, women and children in Cape Girardeau who are working hard to ensure a greener, healthier tomorrow for us all."